Fig. 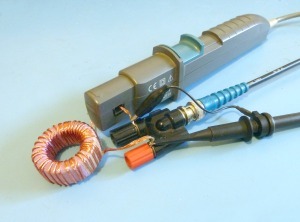 1: A coil connected to a function generator and oscilloscope. The main and most dominant parameter of a resistor, capacitor or coil can be easily determinated by a single measurement. However, if one needs a complete picture of the main and parasitic properties, then a single measurement is not sufficient. In such a case it is necessarily to do many measurements over a wide frequency range. The parameters can be determined on the basis of a theoretical model and a set of measurements. The theoretical model plays an important role in the measurement of the parasitic parameters. The model describes how the main and parasitic components are arranged. And therefore how the measured voltages, currents and phases are related to these parameters. Every component can be calculated with the measured data and the mathematical model. But when the measured data is processed, it sometimes turns out that the theoretical model doesn't fit the real world, and so a more refined model must be applied. Fig. 2: Circuit for measuring impedance characteristic. The part under test, labeled with Zx, is connected to a function generator. The probe for the voltage measurement is connected as close as possible to the part, and the current probe is placed over one of the part leads. The function generator is set to a sinewave with a maximum amplitude (10 Vpp). The oscilloscope channel coupling is set to AC. When measuring electrolytic capacitors it's important that the voltage across the capacitor never becomes negative. Including an offset voltage on the function generator settings can prevent this. The measurement cycle includes many individual measurements at different frequencies. The function generator is first set to a low frequency, and the values of the frequency, voltage, current and phase are measured and noted. Subsequently the frequency is increased and all the values are measured again and noted. Those steps are repeated till the required frequency range is covered. For example, the frequency can be increased in 1-2-5 steps. Fig. 3: A snapshot of the scope screen during the impedance measuring. The acquired measurement data is used to determine the main and parasitic properties. How this data is processed will be explained in the following examples. Each example shows a slightly different method to demonstrate the options. The characteristics in the examples are recorded with an automated measuring system. This will help prevent human errors and speeds up measuring. Fig. 5: The vectors of a theoretical capacitor model. Fig. 4: Theoretical model of a capacitor. A capacitor exists basically A capacitor is composed basically of two conductive plates separated by an insulator. Thas forms the capacitance. The plates have a certain length and therefore they also have a certain resistance and self-inductance, that are connected in series with the actual capacitance. The ohmic resistance and self-inductance depend highly on the physical structure. Also the dielectric plays a major role, and is represented as an ohmic resistance. The electrolyte in electrolytic capacitors also has an ohmic resistance. Fig. 6: Impedance and phase characteristic of a capacitor. Figure 6 shows the theoretical impedance and phase characteristic of the model in figure 4. These curves clearly show the influences of the main and parasitic parameters clearly. The ohmic resistance and self-inductance play no role at very low frequencies. The reactance of the capacitance there is very high and the phase shift is -90°. If the frequency gets higher, the influence of the ohmic resistance and self-induction becomes more important. At a certain frequency the resonance frequency is reached. The impedance is now equal to the ohmic resistance and the phase shift is 0°. If the frequency gets even higher then the capacitance looses its influence. Finally, at very high frequencies, only the self-inductance determinates the impedance and the phase shift is +90°. In this example there is measured on a 33 µF 63 V electrolytic capacitor. The table below has the measured frequency, phase, voltage and current. Here is an explanation how the data is processed using Mathcad. The data is acquired with an automatic measurement setup and is stored as a matrix in a .txt file. This file is read to extract the frequency, phase, voltage and current. The used current probe has a greater delay time than the voltage probe. This delay time must be corrected because otherwise a faulty phase difference is used for the calculations. The correction itself can cause phase shifts smaller than -180° that also must be corrected. The impedance is calculated for all frequencies. The impedance and phase can now be plotted against the frequency. Use for the reactance a log-log graph and for the phase a lin-log type. With these graphs the data can be easily checked for reliability by looking for irregularities. Fig. 7: Impedance and phase characteristics using three measure points per decade. In this example it's notable that from 20 MHz the impedance increases steeper than expected. And the phase falls again, although it is expected to run horizontal. This first measurement was performed at three frequencies per decade. To view the area from 1 MHz and higher in more detail, an additional measurement with 24 measure points per decade is carried out. Fig. 8: Impedance and phase characteristic, from 1 MHz onwards there are 24 measure points per decade. The phase characteristic shows a small bump at 40 MHz, but without a detailed analysis it's difficult to tell what causes this irregularity. It could be caused by the capacitor itself or the measurement setup. But, because it is now of no importance, it will be ignored. To calculate the capacitance a measure point is chosen which lies on the falling slope of the impedance curve. This is marked as n=3 in the first chart. With the measurement data for this point the reactance and the capacitance is calculated. The self-induction is calculated from a measurement point that lies on the rising slope in the impedance characteristic. This is measurement point m=16. The measurement data of this point is used for calculating the reactance and the self-induction. Not necessarily, but educational: In order to compare the frequency dependent reactance of the capacitor with the measured impedance, first a frequency range is defined equal to the frequency range of the measurements. The frequency range must be exponential in order to prevent that there are too few calculation points in the low-frequency range and too many in the high section. The reactance of the capacitance and self-induction as function of the exponential frequency is calculated. The calculated reactance functions of the capacitance and self-induction can be plotted in a graph along with the measured characteristic. The red line is the reactance of the capacity as a function of the frequency and the blue line represents the inductance as a function of the frequency. The calculated functions fit the measured data nicely. Fig. 9: Impedance characteristic with the reactance of the self-inductance in red, and the reactance of the capacitance in blue. Finally the frequency depending ohmic resistance can be calculated. At lower and higher frequencies the calculated resistance becomes more unreliable. Small measurement errors have a large influence in these sections. Fig. 10: Ohmic resistance as function of the frequency. It would be expected to see here an increase of the ohmic resistance with the frequency due to the skin-effect. But the curve shows the opposite, because this measurement arrangement isn't fully high frequency proof and the probe impedance isn't included in the calculation. Small errors occur that make the calculation of the frequency depending resistance not accurate enough to see the small variations. Fig. 11: Theoretic model for inductors and resistors. Inductors and resistors are quite similar in construction. They made from a wire or film wrapped around a body. This configuration has a certain self-induction and the wire length gives it a certain ohmic resistance. Because the self-induction and resistance arise from the same wire, the both components are configured in series. Each turn lies next to another turn. This construction of two conductors separated by an insulator is actually a capacitor. This capacitor is connected in parallel with the resistor-inductor series circuit. The core of an inductor gives some losses due to the hysteresis and eddy-currents. The eddy-currents occur also in the wire. These frequency dependent losses can be seen back as an extra ohmic resistance. Fig. 13: Impedance and phase characteristic for inductors and resistors. Figure 13 shows a theoretical impedance and phase characteristic of the inductor model in figure 11. The chart shows clearly the influences of the main and parasitic components. At very low frequencies the self-inductance and capacitance play no role. There the ohmic resistance is dominant. At a little higher frequencies the horizontal ohmic section shifts gradually to a rising slope and the phase changes gradually from 0° to +90°. In the rising slope the impedance is pure inductive. The peak in the impedance curve is obviously visible. This is the resonance frequency of the tank circuit consisting of the inductive and capacitive components. The phase chart shows at the resonance frequency a sudden phase change from +90° to -90°. At the following falling slope in the impedance graph the influence is purely capacitive. The table below shows the measurement data belonging to an aircoil. This inductor has 105 windings distributed over 5 layers on an ETD39 bobbin without ferrite core. Below an example how this measured data is processed in Mathcad. The used current probe has a greater delay time than the voltage probe. This delay time must be corrected otherwise a faulty phase difference is used for the calculations. The correction itself can cause phase shifts smaller than -180°, that also must be corrected. The impedance and phase can now be plotted against the frequency. Use for the reactance a log-log graph and for the phase a lin-log type. With these graphs the data can easily being checked for reliability by looking for irregularities. Fig. 14: Impedance and phase characteristics using three measure points per decade. The impedance curve has a smooth gradient till 1 MHz. At 10 MHz the resonance peak is visible but isn't so sure as expected. The curve doesn't run smoothly in this region. The phase curve shows an irregularity at 500 Hz. This is probably due to some noise on the signal that cause some difficulties to measure the phase correctly. More important is the phase step between 10 and 20 MHz. Normally this has to be much steeper. Another issue is the flat section before the phase step what isn't quite flat. The area from 1 MHz on has to be looked at in detail. Otherwise the parasitic capacitance can't be determined. That means that additional measurements must be made to fill the gaps between points. The first measurement was done with three frequency points per decade. To view the area from 1 MHz on in detail the number of points is first increased to 6 measure points per decade. This result was a more irregular graph. Even an increase to 12 points per decade wasn't sufficient. Only 24 points per decade resulted in a reliable result and are displayed in figure 15. For comparison, the first measurement curve is also shown in a thin blue line. Notice where the first measure points meet the point of the detailed measurement. The detailed measurements reveal not one, but three clearly visible resonance frequencies. The main resonance peak is found at 11 MHz. Fig. 15: Impedance and phase characteristic. From 1 MHz onwards recorded with 24 measure points per decade. For comparison: the blue line is the measurement with 3 point per decade. If the measurement instruments were operated manually and not by an automated system, then doing 24 measurements per decade is very much. The number of measurements can be limited by doing only those additional measurements on frequencies where irregularities are found. To calculate the self-induction and ohmic resistance one measurement point is used. This measurement point must lie on the impedance curve where the transition between the ohmic and inductive behaviour takes place, and the phase lies between 30° and 60°. That point is marked as n=8. With the measurement data of this single point the reactance and self-induction is calculated. And the ohmic resistance is calculated. Also for the calculation of the capacitance one measurement point is used. Because there isn't a clear distinguishable falling slope, the resonance frequency for this case. In the graph of figure 15 marked with m=40. With the data of this measurement point and the previous calculated self-induction, the capacitance can be calculated. The voltage probe is connected in parallel with the inductor. Therefore the capacitance of the probe has to be subtracted from the calculated capacitance. The probe capacitance is 12 pF. The parasitic capacitance is therefore: 19.1 pF - 12 pF = 7.1 pF. This is a very low value. Just the self-induction and resistance are calculated at one single frequency. These parameters can also be calculated as function of the frequency. With the measured voltage and the reactance of the capacitance, the current through the capacitance is calculated. With the capacitive current, the measured current and the measured phase the current through the series circuit of the self-inductance and resistance can be calculated. The dotted triangle in the left vector diagram is applicable here. The phase shift between the voltage and the current of the RL circuit is calculated. The right vector diagram is used. The voltage across the self-induction is now known, and therewith the self-induction is calculated. Also the voltage across, and the ohmic resistance itself is calculated. Fig. 16: Vectors associated with the calculations. Both of these diagrams are the same, whereby the right one is tilted to calculate the current through RL section. Fig. 17: Ohmic resistance and self-induction as a function of the frequency. The ohmic resistance is pretty constant till 20 kHz, above there the value increases quickly. This is what has been expected due to the skin-effect. The curve becomes ragged above 100 kHz and is an indication that these values are unreliable. The graph thereunder shows the frequency dependent self-induction. The area below 1 kHz is very rough. This is caused by the phase shift that is very close to zero degrees and small measurement errors here have a huge impact. At higher frequencies the inaccuracy of the model plays a larger role. The reliability of the values is largely dependent on the error magnitude and the accuracy of the model. The shape of the impedance curve at high frequencies indicates that the inductor starts to behave as a transmission line, that isn't covered by the used model.